Update 10/08: Attention diabetics! I made this recently with stevia! For those that don't know, stevia is a natural plant product that is molecularly structured so that it doesn't enter the bloodstream and mess with your blood sugar levels. 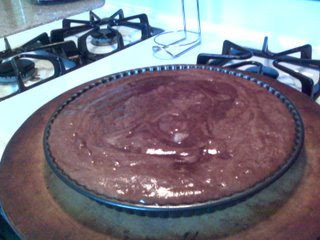 I substituted 1/4 cup of stevia for the 1/3 cup of sugar. Also, because this is flourless, you don't get the blood sugar change from the carby flour either! Today I tried a new recipe and it was a hit. 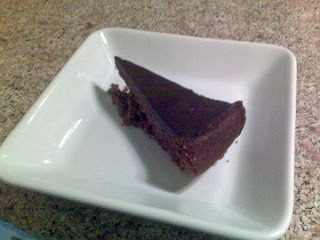 Chestnut Chocolate Truffle Cake - flourless. I was especially thrilled because my best friend's sister is a 5 star pastry chef and she declared it delicious. The recipe, below, is European and in metric. But I've supplied the American equivalents next to it. Another important aspect is the chestnut piece. You'll see that it is labor intensive with roasting and boiling fresh chestnuts. But my Romanian coworker saved the day. 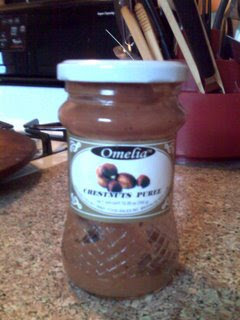 She told me of a European market that sold the chestnut puree in a jar (Marconi and Fair Oaks Blvd.)! Now I can make this cake any time! The texture of this cake is really light and smooth. And with the chestnut puree, it is a very easy recipe. Melt the chocolate and butter together in a pan over a very gentle heat. In another pan, heat the chestnuts with the milk until just boiling, then mash thoroughly with a potato masher (or process to a rough purée in a machine). This is where I substituted the puree, so I didn't use milk at all. Put the egg yolks in a bowl and mix with the caster sugar. Stir in the chocolate mixture and the chestnut purée until you have a smooth, blended batter. Whisk the egg whites until stiff and fold them carefully into the batter. Transfer the mixture to the greased, lined tin and bake for about 25–30 minutes until it is just set but still has a slight wobble.